This map demonstrates territory of Finland, of Russia, of Ukraine. On this map city Kostomuksha free download. You can find here town Kem' presented. Displayed town Belomorsk free download. Displayed town Kalevala marked. You can find here town Rabocheostrovsk download for free. You can find here town Borovoy for Garmin. You can find here town Pyaozerskiy marked. On this map Solovetskiy for Garmin. On this map Ambarnyy marked. On this map Engozero download for free. 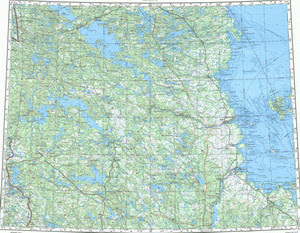 On this map Voknavolok free download. On this map Voynitsa presented. Displayed Boyarskaya marked. You can find here Zhavnyavaraka marked. Zalambino download for free. Displayed Yuvalaksha marked. On this map Yushkozero for Garmin.